Pretreating or Brining is the application of salts to paved surfaces bofore and during the early part of a sleet or snow storm. The salt may be rock salt or another deicing compound such as Ice B'Gone Magic. It may be applied in a granular or liquid form. The process is often referred to as Brining when applied in liquid form. Pretreating prevents ice and snow from bonding to pavement. This Initially improves safety by helping to prevent the formation of hazardous ice on roadways or parking lots. It additionally makes the removal of snow more effective later by preventing the snowfall from bonding as ice or ice-like snowpack to the pavement. Pretreating before a storm can often eliminate the need to deice later. Why Use Alternatives To Salt? Ice B'Gone Magic is a pretreatment which prevents freezing at lower temperatures than normal salt. It is also less corrosive to surfaces, safe for brick and concrete, and environmentally friendly. 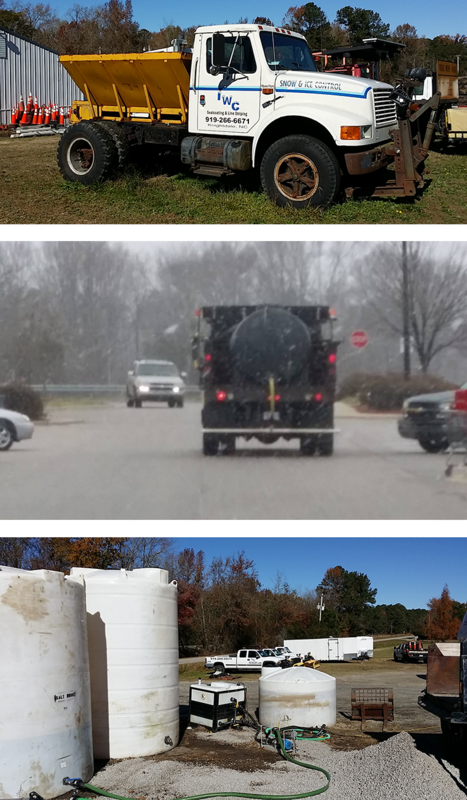 Give IWC a call or contact us online today to find out more about how IWC can put pretreating to work for your business or organization's roads, parking lots, or other paved surfaces this winter.